There is no sexism, no racism, no species-ism in the term “Earthling”. Each and everyone of us, warm or cold blooded, mammal, vertebra, bird, reptile, amphibian, fish and human alike. Humans therefore being not the only species on the planet but share this world with millions of other living creatures as we all live here together. However, it is the human Earthling who tends to dominate the Earth, often-times treating other fellow Earthlings as mere objects! WARNING: The following video contains EXTREMELY GRAPHIC IMAGES! Directed by Shaun Monson, EARTHLINGS is an award-winning documentary film about the suffering of animals for food, fashion, pets, entertainment and medical research. 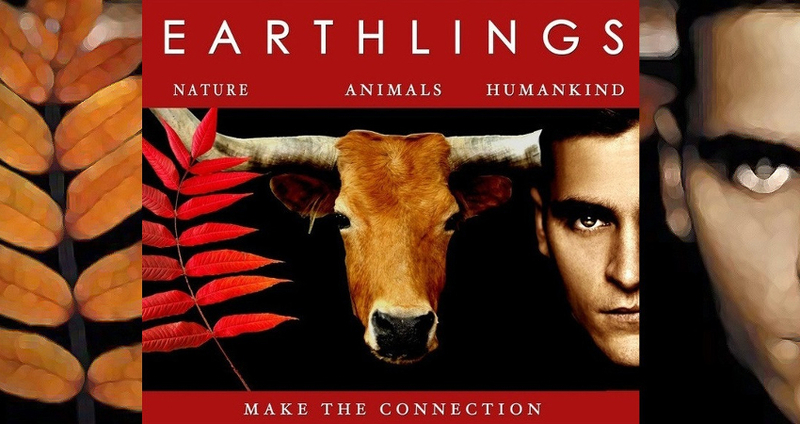 Considered the most persuasive documentary ever made, EARTHLINGS is nicknamed the Vegan maker for its sensitive footage shot at animal shelters, pet stores, puppy mills, factory farms, slaughterhouses, the leather and fur trades, sporting events, circuses and research labs. The film is narrated by Academy Award® nominee Joaquin Phoenix and features music by platinum-selling recording artist Moby. Initially ignored by distributors, today EARTHLINGS is considered the definitive animal rights film by organizations around the world. Of all the films I have ever made, this is the one that gets people talking the most. For every one person who sees EARTHLINGS, they will tell three. EARTHLINGS – Make the Connection.